Gold and silver advanced in January while platinum and palladium declined. U.S. Mint bullion sales of American Eagle coins soared from December and a year earlier. Gold futures changed little on Friday but a lot in January, surging for their biggest monthly gain in a year. Gold for April delivery edged up 30 cents on Friday to settle at $1,116.40 an ounce on the Comex division of the New York Mercantile Exchange. "Interest-rate jitters going forward are what brought gold up," Bloomberg News quoted James Cordier, the founder of Optionsellers.com in Tampa, Florida. "With stock markets crashing all over the world and the U.S. economy growing slowly, nothing is pointing to more rate hikes, and that’s why gold is rallying." Gold prices advanced 1.8% on the week and rallied 5.3% in January, their best monthly increase since soaring 7.5% in January 2015. On Tuesday, the yellow metal closed at $1,120.20 an ounce for its highest settlement since Nov. 2. "This week 994 people voted in the online survey. Of those 810, or 81%, said they are bullish on prices next week — the same percentage hit in the previous survey. At the same time, 112 people, or 11%, said they are bearish on gold next week. Only 72 people, or 7%, said they are neutral on the yellow metal. Sentiment among market professions was also positive, albeit lower than the retail segment and down from the previous week. Out of 34 market experts contacted, 17 responded, of which 10, or 58%, said they expect to see higher prices next week. Four professionals, or 24%, said they see lower prices, while three people, or 18%, are neutral on gold." In other precious metals dealings, silver for March delivery added 1.1 cents, or about 0.1%, to settle at $14.243 an ounce. Silver prices gained 1.3% on the week and moved 3.2% higher on the month. On Tuesday, silver futures ended at $14.56 an ounce for their best close since Nov. 6. April platinum climbed $6.40, or 0.7%, to $874.30 an ounce, soaring 5.1% from a week earlier. Palladium for March delivery rose $6.50, or 1.3%, to $498.50 an ounce, but slipped 0.3% on the week. In January, platinum declined 2.1% while palladium tumbled 11.3%. Gold shed $2.20, or 0.2%, to $1,111.80 an ounce. Silver added 50 cents, or 3.7%, to $14.08 an ounce. Platinum declined $17, or 1.9%, to $866 an ounce. Palladium rose $2, or 0.4%, to $501 an ounce. 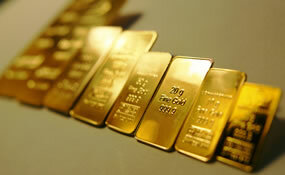 For the week, gold rose 1.4% and platinum gained 4% while silver dipped 0.6% and palladium fell 1.2%. For January, gold and silver surged by 4.6% and 1.9% while platinum and palladium dropped by 0.7% and 8.4%. American Eagle gold coins hit 124,000 ounces, racing 248 times faster than in December and climbing 53.1% higher than in January of last year when 81,000 ounces sold. The U.S. Mint is rationing weekly sales of American Eagle silver coins because of silver planchet shortages. Still, they shot up by 5,954,500, the most for a month since January 2013 sales of 7,498,000. The monthly tally is the fourth highest since the coins were introduced in 1986. Silver Eagle sales grew 155.2% from December’s level of 2,333,500 coins and 7.7% from the January 2015 mark of 5,530,000 coins. American Buffalo gold coins moved up by 34,000, jumping about 22.7 times higher than in December but slipping from January 2015 by 500 coins or 1.5%. Below is a sales breakdown of U.S. Mint bullion products with columns listing the number of bullion coins sold during varying periods. Products with an asterisk (*) have sold out. American Silver Eagle and American Buffalo gold coin figures were revised to reflect updated January sales provided by the U.S. Mint on Feb. 1.